For many years, Mark Van Name and I wrote reviews and columns for computer publications like PC Week, Byte, and PC Magazine. I often miss being able to tell the world my opinions of technology products. Admittedly, this blog does not have quite the reach of those publications, but it is nice to have some outlet for my opinions other than random people I manage to corner at social gatherings. The following are a group of products I set up in my home over the last few months. There is another product on my pile to play with and include here, the Nest thermostat. I have been meaning to install it for about nine months, but never quite get around to it. Rather than put this blog entry off any longer, I decided to go ahead and discuss the other two. All of three of the products are home integration/automation products that use WiFi. In my opinion, the battle between wireless, home-automation standards (such as Zigbee, Z-Wave, X10/electrical wiring) is over and WiFi has won. While the others were trying to gain acceptance, WiFi quietly got cheap enough and became so pervasive that there is no reason to think of using any other standard. The other big trend these products highlight is that dedicated remote controls are dying. Your new remote will be your phone or tablet. The combination of these technologies means that sitting here in my home office, I can use my phone to turn on the lamp, adjust the temperature, and play my choice of music at the volume I want on my stereo. Belkin WeMo – Over the years I’ve tried X10 (it never worked well for a number of reasons) and other approaches to home automation. I’ve also long used mechanical devices to turn lights on and off automatically. One of those devices recently stopped working. I looked for a replacement and discovered the WeMo. It is basically just a WiFi-controlled, electrical outlet. It is a very simple device, but works very well. After setting it up, I can check on the status of the outlet which controls a lamp and turn it on or off from anywhere using my iPhone. I can also create simple programs to automatically turn the outlet (and the lamp) on and off at specific times during the day. The WeMo has a great solution for how to get the device initially onto a WiFi network with a password. Devices with some sort of screen and a few buttons can allow you to enter the necessary password directly (if clumsily). This device has neither. What it does instead is broadcast a WiFi network. You download an app for your phone and connect to the WeMo's WiFi network. You then use the app on your phone to give the WeMo the password to your home WiFi network. The WeMo connects to that network and drops its own WiFi network. Your phone automatically goes back to your home WiFi network and you continue setting up the WeMo. It all went very smoothly. At $50, the device is a little expensive, but I think worth it for spot usage. Of course, the price will probably come down over time. Belkin also makes a motion detector that can be used in conjunction with the outlet. I definitely plan to keep an eye on what they are doing. Of course, I’m also looking forward to getting my SmartThings Starter Kit later this year after its successful Kickstarter campaign. There are lots of interesting things happening in the home automation space (and on Kickstarter)! Yahama RX-V473 – This device is an audio/video receiver I got for my home office. It does a great job as a receiver for my Samsung 3D TV, Xbox 360, and Samsung DVD player, other than occasionally fighting with my cable box over what resolution to display on the TV. The RX-V473 also had a feature I wanted to try out. It turned out to be something I will use a lot more than 3D. The feature is Airplay support. AirPlay is an Apple protocol for streaming content over WiFi. It allows me to stream audio or video straight from my iPhone or iPad to my receiver. That, coupled with the ability to use either of them as a remote control is great. While writing this, I grabbed my iPad from my desk, turned on my receiver, picked an album (Marcus Roberts’ As Serenity Approaches) with my iPad’s music app, told it to use my receiver over Airplay, and my office is awash in beautiful piano music. As a bonus, the receiver shows on its front display the name of the song my iPad is playing. 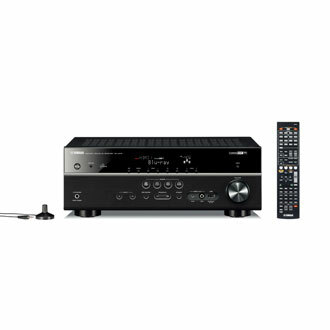 With a list price of $450, this is not a cheap receiver, but it is competitive with similar receivers in its class. I would recommend it to anyone looking for an audio/video receiver, especially if they have other devices supporting AirPlay. I will install the Nest in the near future and let you all know what I think. Once I can change the temperature in my office, I really will have very few reasons to leave my chair! I also need to write up my experiences with high-tech light bulbs as well as an update on my most expensive gadget, my Nissan LEAF. I’ve also made the mistake of finding cool stuff on Kickstarter. That pretty much guarantees a steady stream of technology products to blog about.